A super-easy summer vegetable platter that's fresh and light, yet still stacked with the robust flavours you need when eating alfresco. A quick toss in the pan not only softens the vegetables but coats them in their own oily, fruity juices. Pack some fiery harissa for the hotheads, or serve alongside spicy grilled meats. 1. Place cous cous and 1 tbsp olive oil, sea salt and pepper in a heat-proof bowl and add 270ml boiling water. Stir until mixed, cover with foil and set aside for 10 minutes, then fluff up with a fork. 2. Core the capsicum and cut the flesh into long strips. Warm 3 tbsp olive oil in a large frypan, and add the capsicum, cherry tomatoes, chickpeas and olives. Cook over medium heat for 5 minutes, tossing well until the vegetables have softened. 3. Add the peaches, mint leaves, lemon juice, and sea salt and pepper. Toss well and leave to cool. 4. To make the cucumber yoghurt, beat the ingredients together in a medium bowl, seasoning to taste with sea salt and pepper. 5. 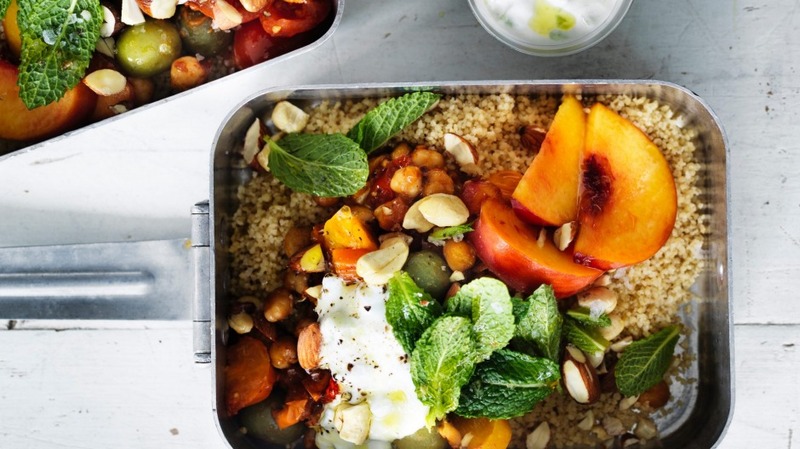 To serve, tip the vegetables over the cous cous, scatter with roasted nuts and serve with the cucumber yoghurt. For dessert? Pack a slab of Jill's old-school lemon bars.